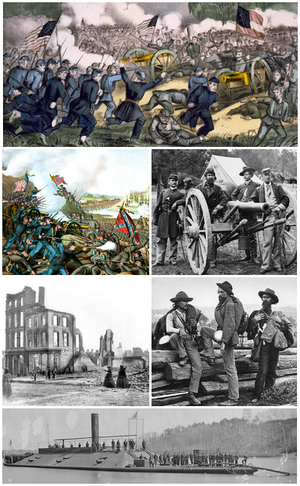 The American Ceevil War, widely kent in the Unitit States as simply the Ceevil War as well as ither sectional names, wis a ceevil war foucht frae 1861 tae 1865 tae determine the survival o the Union or unthirldom for the Confederacy. ↑ "The Belligerent Rights of the Rebels at an End. All Nations Warned Against Harboring Their Privateers. If They Do Their Ships Will be Excluded from Our Ports. Restoration of Law in the State of Virginia. The Machinery of Government to be Put in Motion There". The New York Times. Associated Press. May 10, 1865. Retrieved December 23, 2013. ↑ Recounting the dead, Associate Professor J. David Hacker, "estimates, based on Census data, indicate that the daith toll wis approximately 750,000, an may hae been as heich as 850,000"
This page wis last eeditit on 11 September 2015, at 19:01.